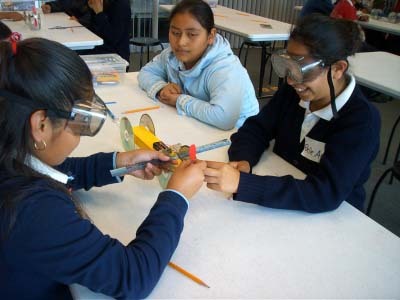 Field trip experiences provide explorations in science, technology, math and engineering for Pre-K through 12th Grade. Interactive exhibits, hands-on programs and docent-led tours make for an engaging adventure in the world of flight. Advance reservations are necessary for all field trips. Two weeks’ notice is required for tours and programs. Earlier booking is encouraged to provide the best selection of dates and times. Minimum group size is 12 students and 2 adult chaperones. 1 adult teacher or chaperone is required per 8 students. Schools that have already booked a field trip may review our Welcome Letter. Both indoor and outdoor spaces are available to eat lunch at the Museum. Bring your own lunch; limited snack and drink items are available for purchase. Plentiful free parking for cars and buses is available at the Museum. Museum admission for field trip groups is $4.50 per student and $9 for adults Monday-Friday, September through May. One adult is admitted free of charge for every eight students. Museum admission for field trip groups is $9 per participant on Saturdays and Sundays, and on all days during June, July and August. All field trips must pay as a group to receive the discounted admission price. Individual admissions must be paid at the general admission rate. Hands-on Programs require an additional program fee that varies by program topic. Advance reservations are required. Admission and program fees must be paid upon arrival by cash, check or credit card. School Purchase Orders are not accepted. A valid credit card is required to complete a reservation. A $25 cancellation fee will be charged for any field trips cancelled fewer than three days in advance. Aero Design Challenge provides a special hands-on engineering program for Grades 5-8 at no cost to groups of 50 or more. 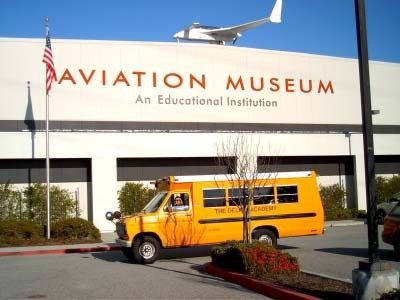 Any school group may visit the Hiller Aviation Museum at no charge on Mondays at the Museum. Visit the Mondays at the Museum web page for a list of available dates and additional information. Any K-12 school group may visit the Museum at no charge on select Mondays, September 2018 – May 2019. All regular field trip policies listed above apply. Mondays at the Museum field trip admission includes a guided tour and one basic hands-on program per child (see program sections at Mondays at the Museum web page. Additional programming may be scheduled at regular field trip prices. Transportation reimbursement is available to qualified schools through the Hiller Aviation Museum’s Financial Assistance program (see below). Visit the Mondays at the Museum web page for a list of available dates and more detailed information. Schools with at least 40% of students qualified to receive free or reduced price meals may complete an Admission and Program Fee Waiver Request to receive fee waivers and priority placement. Loved the hands on learning. Even loved how students know becoming a pilot is a career choice for them. I bring my students here each year. It is a favorite trip! I learn something new each visit. The docents are so friendly and knowledgeable! The workshops are perfect for the age of the students!